A little customer commission I’m just finishing off. 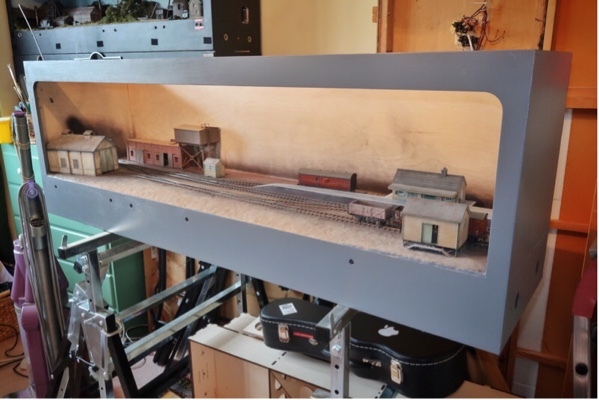 Scenic footprint just 4x1 feet (fiddle yard extra on left hand side still to be built). It depicts a Colonel Stephens-ish branch line terminus. A bit of a squeeze, but managed to get a run around loop in just long enough for two passenger carriages. 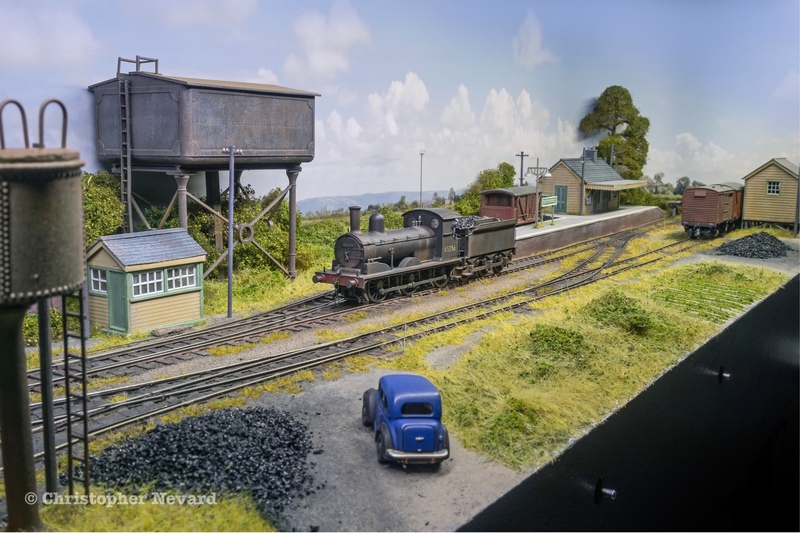 The motley selection buildings are a selection of well known kits and a grubbed up Bachmann wooden engine shed. Track is good old fashioned copper clad which allowed me to fit everything to the small footprint, not be restricted by ready made point geometry. The diorama case is Tim Horn laser kit. For the first time I tried out LED lighting, a mix of warm and cool strips. The backscene my own creation printed at the local printers. Around 85 hours, working on and off, beginning first week of last month. I’ve wanted to build something like this for some time, having a passion for olde worlde run down middle of nowhere. Click on the photos for bigger views you can really zoom in to! 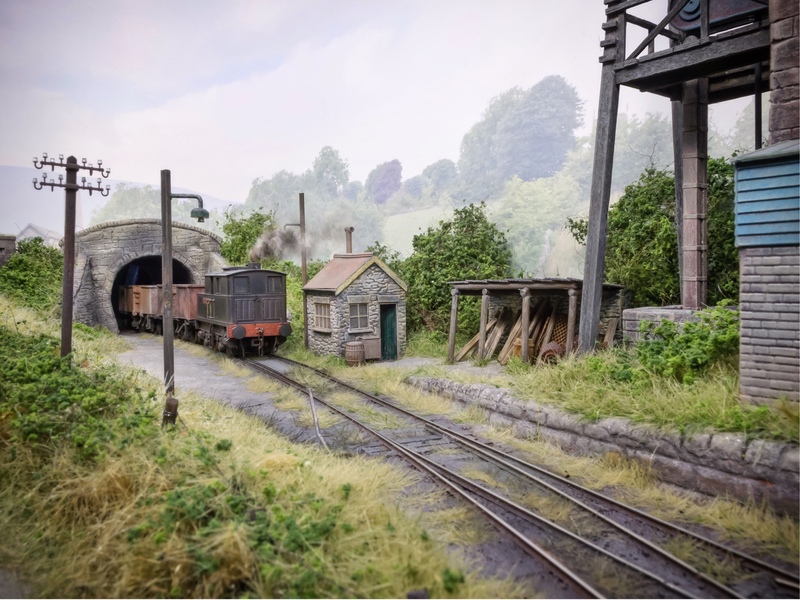 Passing the loading gauge on Polbrook Gurney Colliery. I used code 55 rail here for that lightweight industrial look. Filing the point switch blades takes moments with such fine profile rail. Note one of my ‘budget’ yard lamps. Bbq skewer, bent nail with a slice of plastic tube. 5 mins work. Bamboo blinds make an inexpensive source of fine bamboo otherwise, the lean-to was made from such. Scale OO 1/76. Click on the above photo for a bigger view. I picked up the photo printed backscene a short while ago (from AJ Signs in Guildford). It is intentionally over sized to allow me to trim 3 or 4 cm off the base so it looks right from just above track level. 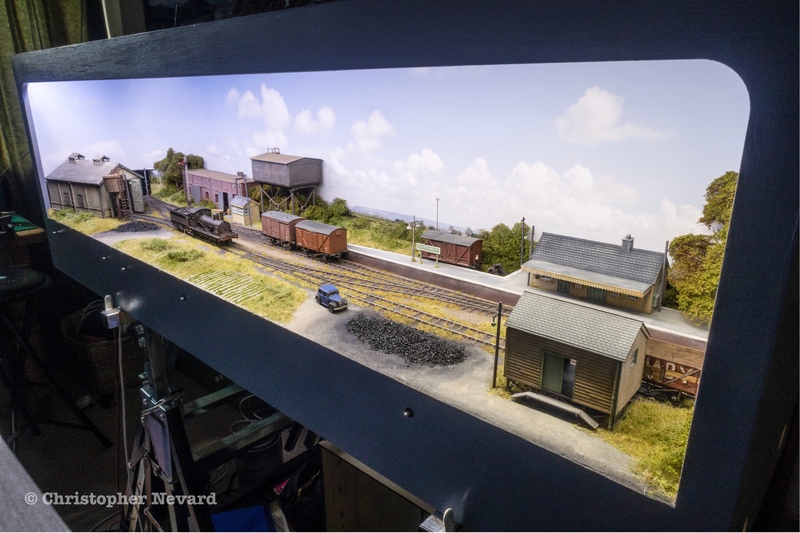 It is simply inserted in to the diorama case temporarily for this photo. Scenic work will hide the transition from 2D to 3D. The backscene is printed on to matt laminated sticky backed plastic, which in turn will be stuck in to card to allow for curved corners. I hope to complete this little layout very shortly. More updates soon. 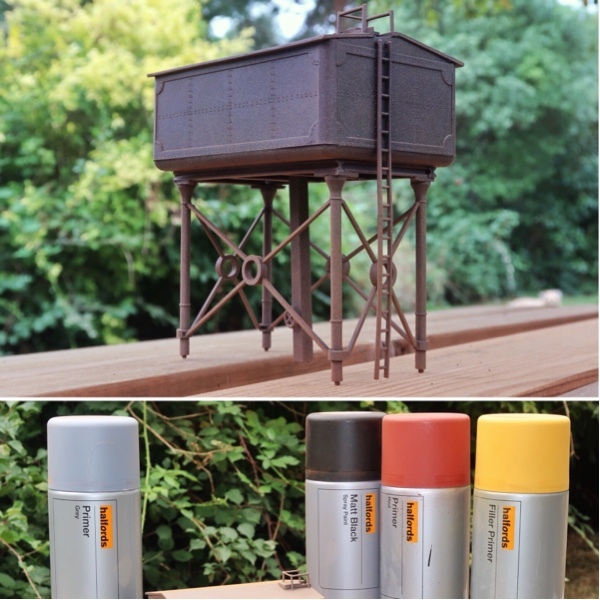 There are many ways to weather models, here’s a Dapol (Airfix) water tower/tank kit (a bargain that can be found for around 6 or 7 ££££) after a blast of a few primers. I usually start with the black and mist over the other shades. The yellow filler primer is fairly new to me, you can use it for lightly misting over Model trees along with the red for an early autumn look too. Here’s the result after 2 or 3 minutes. Further work can be performed with washes and dry brushing if desired. These paints are very toxic, so always work outside if you can and consider a breathing mask. Posh people will have a spray booth. I have to acknowledge the late Allan Downes for this aerosol paint tip. Some progress with a little Colonel Stephens style branch line terminus commission. 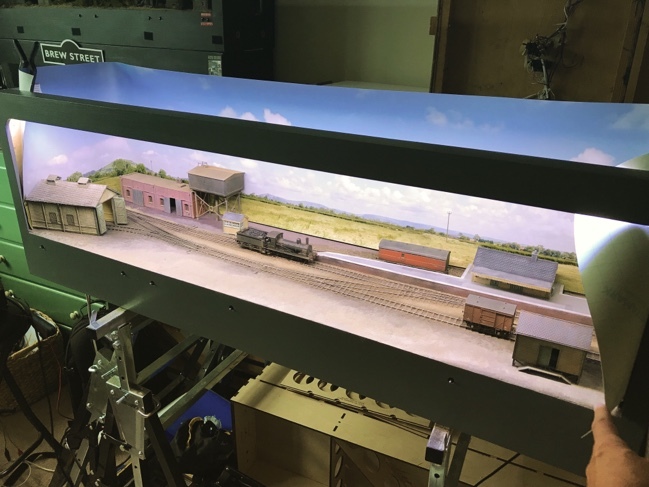 Next to go in will be the backscene which is currently at the printers and some brighter than normal LED lighting which arrived a short while ago. I’ll then be able to perform the scenic work which will transform things dramatically. The little holes along the front now have inset tiny toggle switches for electric point operation. I’ll post more updates soon. Scale 1/76, this space is 4 x 1 feet.